My journey back to painting, gaming, and growth. You are back from your latest road trip to the gaming convention, be it AdeptiCon or NOVA Open or GenCon and you have a couple of those little hotel room key cards still in your pocket. Well you could throw them away...or you could upcycle them into bases for scatter terrain. Living in Florida, I thought the first thing that I should put together is something with an orange tree. The basic requirements are a hotel key card, some Alene's tacky glue, Woodland Scenics Scenic Cement, Woodland Scenics Blended Turf, and a Woodland Scenics Woodland Classics Orange Tree (N, HO, O Scale). The process is pretty straight forward and this little project should not take too long to complete. Start by locating your tree. Depending on the size of the tree that you use, you can get one to three trees on a card. 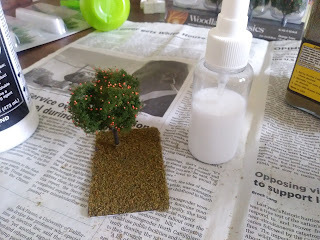 I started with an easy piece for the first go and selected a solitary orange tree. Glue the tree base into the desired location and let dry completely. I didn't scratch off the surface of the key card, but may in my next go to see if the adhesion increases. I did leave the tree together when selecting the placement since it is a good guide to see the canopy of the tree. 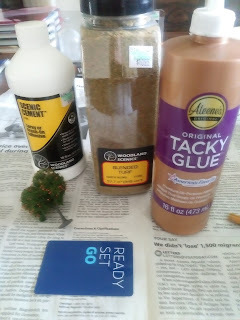 Once set, I watered down some of the scenic cement with water to make a spray adhesive. Remove the tree from the tree base for this part. Spray the entirety of the card with the watered down scenic cement. When covered well, you will then sprinkle on the blended turf. I used newspaper as my work surface so that I could recover any turf that did not adhere to limit any loss. After the first layer is added and had some time to dry, shake off the excess onto the news paper. Now repeat the process for additional layers. I ended up with four applications of spray cement and turf to get to the coverage and thickness that I though necessary. Once you have the coverage that you desire, apply at least one more coat of the watered down scenic cement to the surface and reattach the tree. With play, you will get additional loss but reapplication of the blended turf is quick and easy. Trudging through the wastes...Wasteland Essentials I - This Is Not A Test release! You won't like the wasteland when it's angry! Be a MO, fight cancer! All images on this blog which are not my personal photographs were selected after a Google or Bing search using the Free to Share and Use filter of the images. In all cases, the imagery is used without express permission of the owner though the image URL is included in the caption to direct views to the source. Any imagery that does not have a link is either owned by me or is understood to be freely available for public use. All mentions to commercial entities is done so as a reference with no affiliation to the commercial entity. Thanks for looking this far along. Hope you enjoyed, thanks!. Travel theme. Powered by Blogger.